CCI alumnus Caleb Lawson has one goal for the future: to be the guy people call when they need concrete countertops, in central Florida and throughout the Eastern U.S. He wants contractors, consumers, and others in his area to know that he’s the one to choose for quality countertops done right the first time. He works toward this goal with each and every project. When you see his work, you’ll know this goal is certainly achievable. Gorgeous! I had the opportunity to talk with him about a recent project he completed for an old plantation house in Ormond Beach, FL. This gorgeous home once sat in an orange grove. 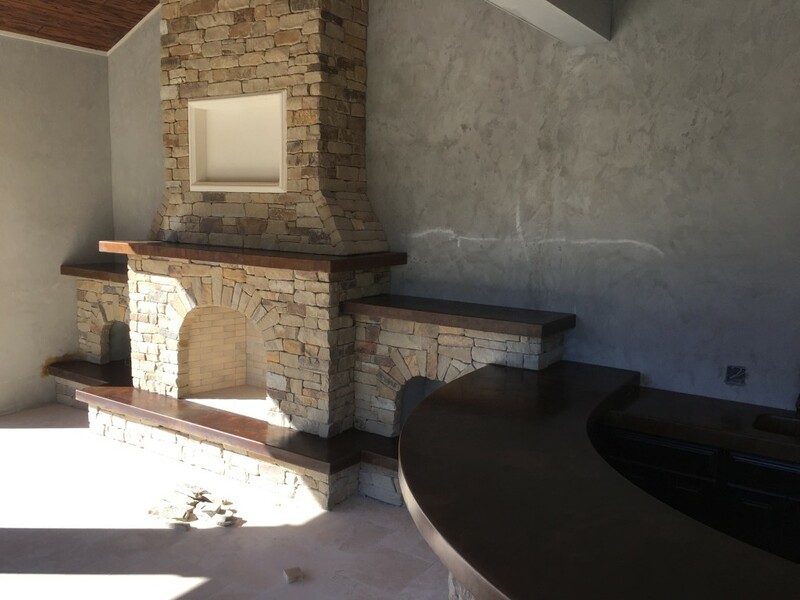 Caleb created the concrete pieces for the outdoor kitchen cabana including a countertop, sink, hearth, and mantle. Each piece is comprised of 3 ½ inch foam core GFRC, stained to a lovely deep brown. As you look at the photo below take a quick peek at the hearth just below the fireplace. Not only is the piece an odd shape, it is over 16 feet long. The hearth was constructed as a singular concrete piece, the longest Caleb has ever created. Getting this oddly shaped, long piece from the shop to the install was certainly a challenge; the piece wouldn’t even fit completely in his trailer. These concrete pieces were heavy. Caleb estimates that the largest one probably weighed close to 1000 pounds, even using GFRC (can you imagine how much it would weigh if it were solid concrete?). The pieces were transported by laying them on their side in a drywall cart, an interesting challenge with the size and shape of some of the pieces. One of the pieces was too tall to fit through the door. Luckily everything made it from the shop to the outdoor kitchen without cracking. This contractor behind this job found Caleb through Google. He’d been looking for a local concrete manufacturer and had called a few other guys in the area. Caleb was told that they had been having a hard time getting people to actually show up to the job site. 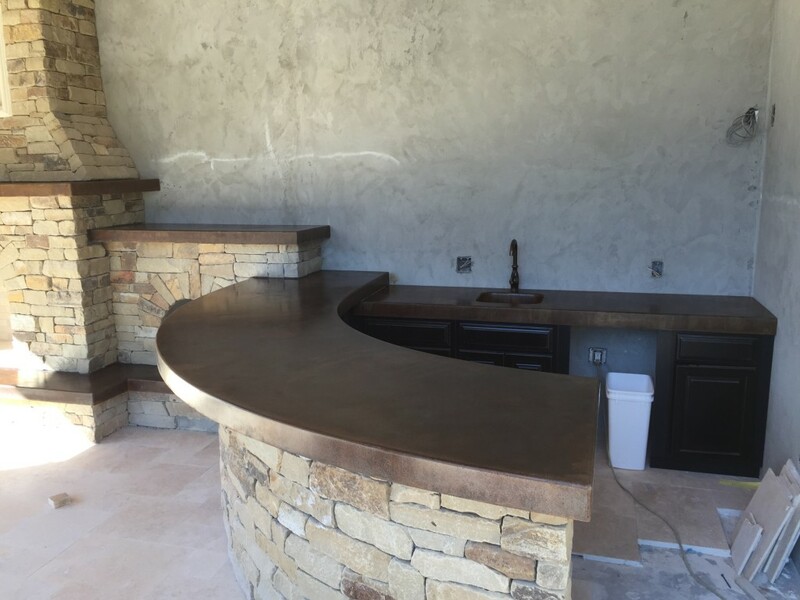 When the contractor contacted Caleb he was happy to come out and ready to jump right into this project. Looking forward, Caleb plans to continue growing his business. He’s the owner of Price Concrete Studio, a business that’s been around for 12 years (he’s been the owner for 2). He has two employees (just hired the 2nd one) at the moment. As his business moves forward, he hopes to continue to grow and to receive recognition for his work. He wants to be the concrete manufacturer you choose when you want the best, not when you’re looking for the cheapest. He’s looking to continually learn new things, expand his skills, and evolve his business. Caleb came into this business with almost no knowledge of the construction industry. He tinkered around a bit on his own and then came to our Ultimate class last October. Since then, his business has taken off and his knowledge continues to grow. In addition to his training he credits his success with his willingness to ask questions and do research. He believes that being willing to recognize there is more to learn is essential. There is always more to learn. Thank you Caleb for sharing your story with us!